Happy Friday! I like to end Friday with something different, like tons of cuteness or a giveaway (latest giveaway can be found here). 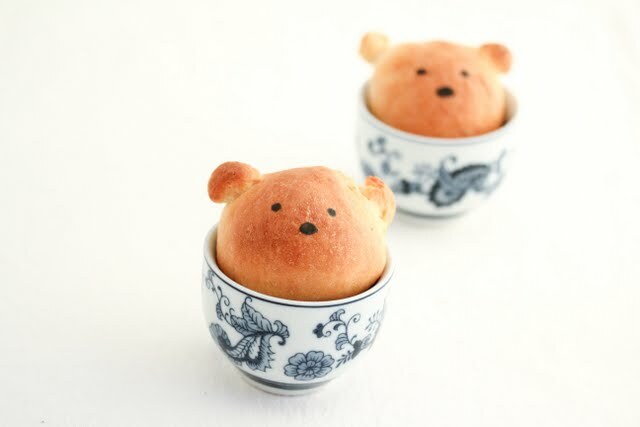 A few months ago I came across this image of bear in cups. 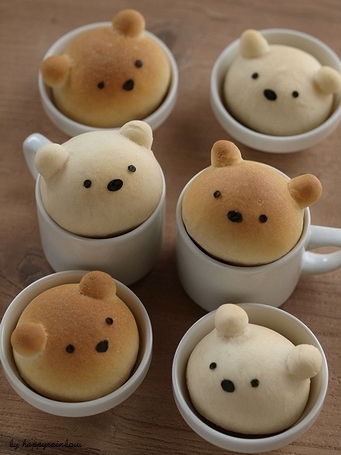 Bear in cups. So simple. Yet so freaking adorable. Ever since, I’ve been trying to recreate it but without much success. Finally I had some decent success recently that I thought I’d share. Not nearly as cute as the original image, but pretty cute if you haven’t seen the original image. I don’t know the technique for making the original ones I saw, but they are all perfectly shaped. So maybe they were done by a professional bakery? I tried baking the bread balls in the cups before and that led to them being oddly shaped when the bread rose in the oven. This time I shaped round bread balls and baked them separately. While I tried to make the balls all the same size, they didn’t end up being completely the same. Also the balls were not perfectly round either. I ended up baking the balls on a baking sheet, making them the approximate size of what I wanted. Then I searched for teacups that would fit them perfectly. Luckily I have a few different sizes. This is probably as good as my version is going to get. I had fun staring at them. I didn’t take any pictures of my technique because I didn’t know if it would work. Details of my technique are at the end of this post. 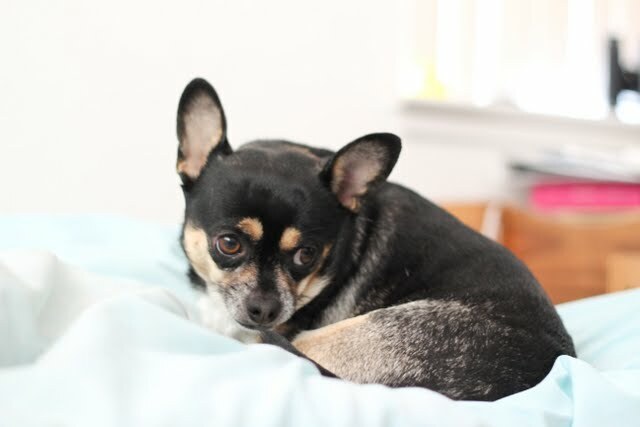 While we’re on the subject of cuteness, I thought I’d share some recent pictures I took of the dogs in my life. 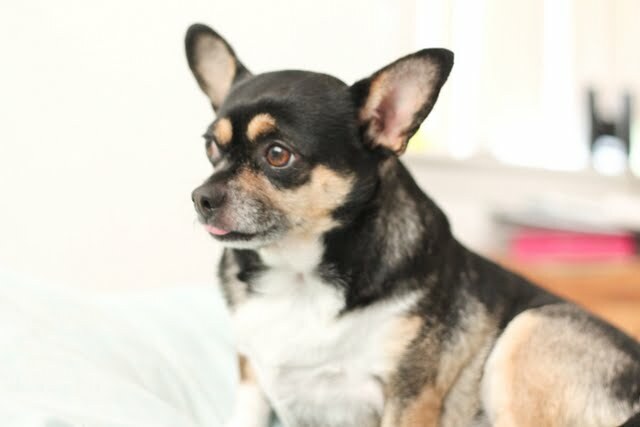 Here is Zephy, my brother’s girlfriend’s dog, that spends a lot of time at my place. One of his favorite things is to perch on the very narrow space on the top of the couch. I’m always afraid he will fall. I’ve explained in previous posts that Zephy always has one ear permanently perked up, making him always look so curious. 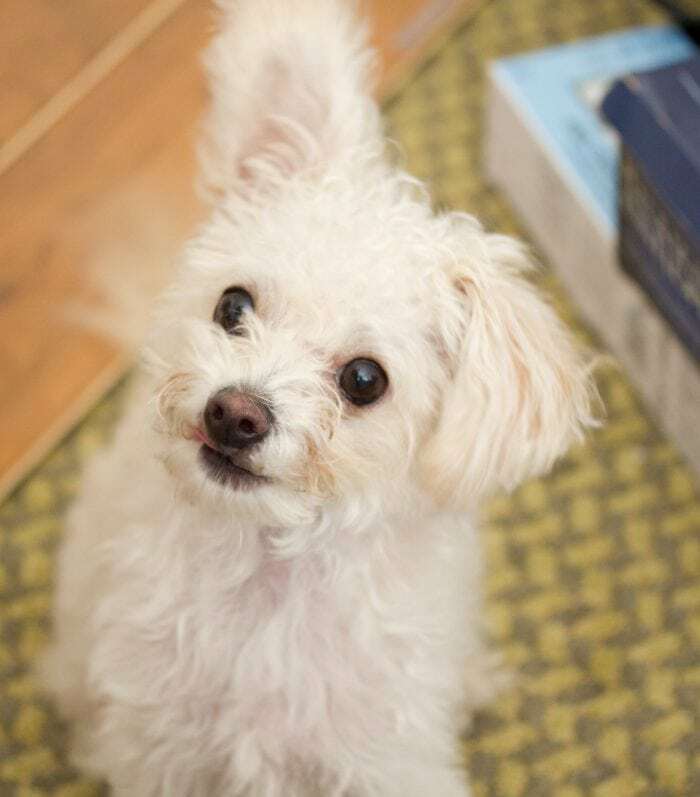 On a recent trip home, my dog Mochi sat still long enough for me to take pictures of her. She normally doesn’t like pictures, so this was a rare lazy morning where she allowed multiple pictures. I love how these pictures came out. You can still enter my latest giveaway here! 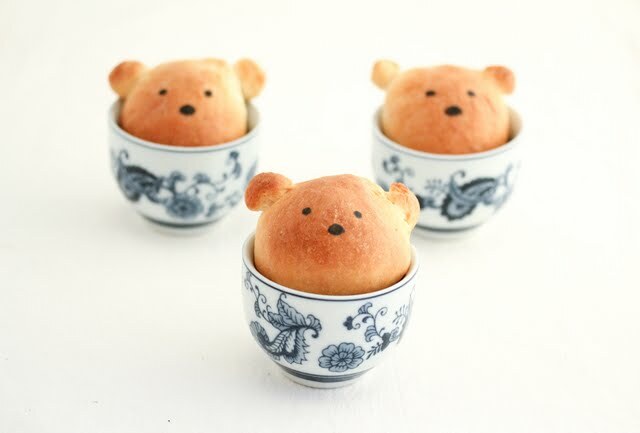 These adorable bread bears in teacups are a fun way to serve bread for a special occasion dinner. Your choice of bread recipe. You can use almost any yeast bread recipe to make these. I used the hokkaido recipe since I had too much dough to fit into one loaf. After first proofing of dough, take chunks of dough about 1 inch in diameter and roll to form round balls. Take smaller chunks to add two ears to each bear. Make sure to smooth the doughs for ears firmly into the larger face ball or else the smaller chunks may fall off when rising or baking. Let dough sit for second proofing so that they rise almost double in size. Place bear heads onto baking sheet lined with parchment paper. For my recipe, it required baking at 350°F. I baked these until golden, about 15 minutes. After bread has cooled, place them in teacups. Use an edible decorating pen to draw eyes and nose on bear faces. OMG that’s a boatload of cuteness! I love how the little bears turned out. I could use Zephy and Mochi as snuggies this morning. Heehee. Mochi loves snuggling. Her favorite thing to do is to jump into someone’s bed in the morning and she likes to lay in people’s laps. Zephy is still super super active. He never sits still. Sometimes I just want to snuggle with him and he will just jump up and get a toy and want to play non-stop. These are sooooo cute! (insert high-pitched squeal) I also like your blue print teacups. I wondered how the cups would hold up in the oven, then I read the rest of your post. I may need to do something bear-related at the end of the month, so this is a great idea. Well the cups actually do hold up well in the oven. In my first attempt, I did it that way and was a little afraid they wouldn’t. But yeah, the problem was that the bread took the form of the cup so it ended up having a weird shape instead of a perfectly round face. Haha, yeah it’s funny. His tail his really long too, like the length of his body. It’s big and fluffy but I’m always afraid of stepping on it. 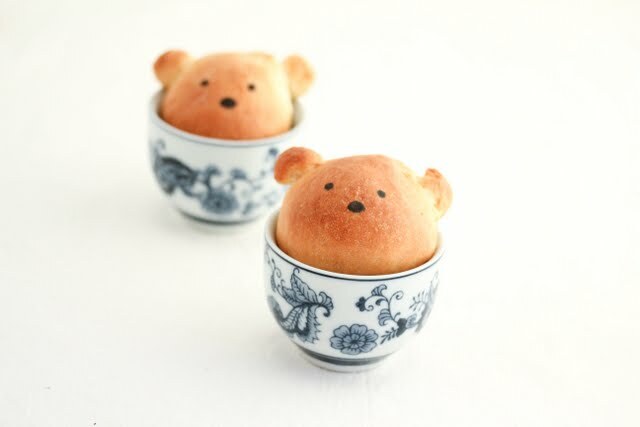 1) Those are the cutest breads-in-cups EVER. 2) That white doggy is precious. 3) I already knew I liked you, but then I saw that you named your dog Mochi, and now I know I <3 you…I have a cat named Mochi! Hi Tina- OMG! That is just one of many similarities we have!! I was actually showing your blog to FH the other day and saying how similar we are. He was sad that the sci fi aspect of you wasn’t true for me since he loves sci fi shows. Such a cute post, teddy bear rolls and puppies! Everything in this post is unreasonably cute! And I just saw your turtle breads, I think I’m going to explode with cuteness. How cute are these?! You could also write names on their bellies and use them as place”cards”. Oh that is a great idea! I love the photo too! You did a great job!! Yours look pretty darn good, very much like the originals! Thank you so much for providing this link! If you could translate that would be great though I can try google translate too. The pictures are really helpful. I saw the picture and I searched for the post. I saw a few sources for the picture, but I never came across this site with the step-by-step. Perhaps the recipe they used also makes a difference. Thanks so much for your help! gosh, how did i miss this post???? So cute! I love those bears in cups!!!!!! 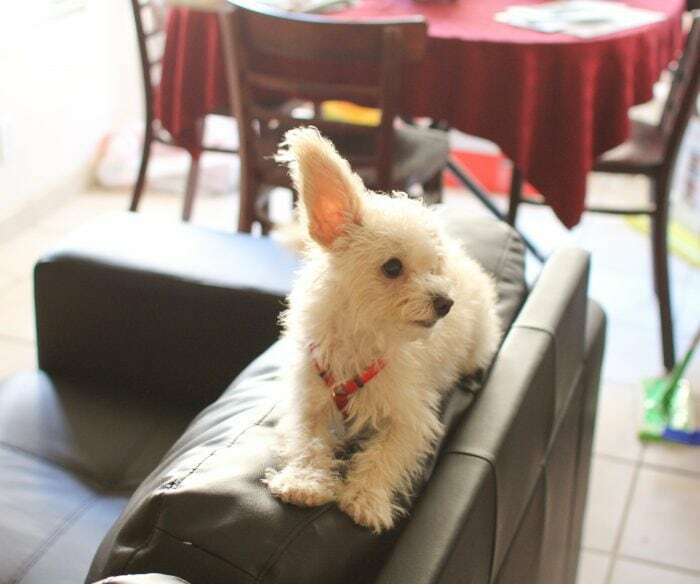 Your dog mochi is also adorable and so is Zephyr (love the perked up ear!)! Hehee, thanks! I’m going to try to figure out the japanese version too now that I have a link. Due to recent policy changes the listing of recipes, do-it-yourself items, images, wallpapers and other items found freely on the Internet are allowed, as long as they do not violate any copyright infringement rules. We allow these types of auctions because some users enjoy such auctions and as such, there is a demand in our marketplace for them. 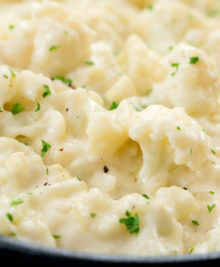 The following copyrighted material is not allowed and may not be auctioned though: Recipes copied from cookbooks or online cookbooks; do-it-yourself designs/patterns copied from books and sent via e-mail; images and wallpapers of celebrities or associated with any product, company; or images that have been professionally created by someone other than the seller. Listia is committed to protecting the intellectual property rights of others and to provide a safe and fun place to buy and sell items. Intellectual property owners can report any listing to us that is believed to infringe upon their rights. Since the intellectual property owner themselves are responsible for protecting their intellectual property, and Listia is not an expert in intellectual property, we require that the original owner, or an agent of the owner, officially report the item to us. For the protection of everyone involved, we require that the Notice of Claimed Infringement form be completed and submitted, prior to the removal of the auction. Please email the signed form to [email protected] as well as attach it to this ticket. The person signing the form is doing so under the penalty of perjury. Thanks for letting me know. Unfortunately, it’s not clear which recipe they are selling. I imagine based on the photo they might be selling the original Japanese recipe.